daily dose of spazz: Two More Mail Treats! Since I joined the RAK (random acts of kindness) blogger list on SCS, I have been getting so much good mail! I love it. 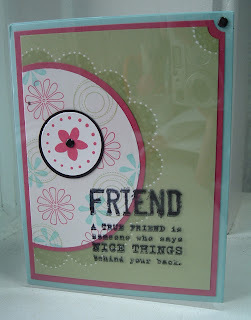 This first card is from Cindy Keery who is truly an amazing stamper. 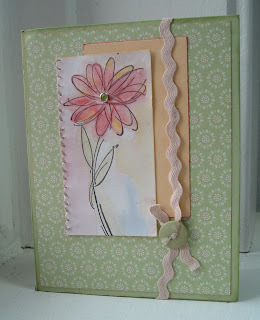 She has all kinds of fabulous cards in her SCS gallery and on her blog Imagine.Dream.Create. 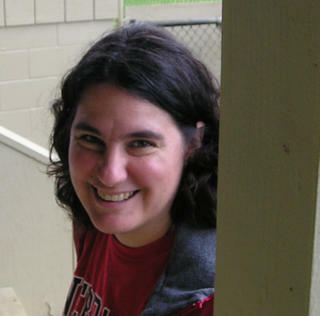 She is also makes fabulous watermarks, so if you are in need of one, check out her samples. Thanks Cindy for the great card, the watercoloring is truly amazing and I love the little bling in the center, too cool! The second card is from Beate. When I was talking recently with a fellow stamper, I asked if she had heard of Beate or seen any of her amazing work in the Stampin' Up! publications. Her response, "She is legendary." And she is! Her card is so beautiful and wonderfully designed. And the color combination is so much better in person. For more inspiration, check out her blog, Fresh&Fun. Thank you so much for this great card, people who have seen it sitting on my mantel and commented on how cool it is with the great window sheet front. Cracks me up to look at the picture of the card because you can clearly the camera reflected in the card. Thanks for the great card. Ok, now back to work on my unfinished projects with deadlines quickly approaching. Truly beautiful cards, what great talent. I have that stamp on #1, I'm so scraplifting!